02 Dec 2015: Day one with the OSVR hacker dev kit on Fedora 22. First issue was that osvr_server wasn't finding the device, but it was definitely showing up with lsusb etc and being picked up correctly with the right kernel drivers. I'd added a udev rule to make sure my user had permissions to the device. The audio device was also being picked up perfectly and working for input/output via pulseaudio. Hmmm. Removing the lines and recompiling let osvr_server find the device. Wohoo. Looking at a newer upstream version of hidapi shows these lines are no longer there too. I'll look into later what's the right fix they need! My GPG key has lasted me well, over 18 years, but it's a v2 key and therefore no longer supported by newer versions of GnuPG. So it's time to move to a new one. I've made a transition statement available. If you signed my old key please consider signing the new one. April 01 - Google contact the Google OpenSSL team members with details of the issue and a patch. This was forwarded to the OpenSSL core team members (1109 UTC). Original plan was to push that week, but it was postponed until April 09 to give time for proper processes. Google tell us they've notified some infrastructure providers under embargo, we don't have the names or dates for these. April 07 (0556 UTC) OpenSSL (via me) notify Red Hat. Red Hat internal bug created. This is the time Red Hat was officially notified under embargo, engineers and the Red Hat Security Response Team started working on the issue. April 07 (0610 UTC) Red Hat contact the private distros list (https://oss-security.openwall.org/wiki/mailing-lists/distros ) and let them know an OpenSSL issue is due on Wednesday (no details of the issue are given: just affected versions. Vendors are told to contact Red Hat for the full advisory under embargo. April 07 - OpenSSL (via Red Hat) give details of the issue, advisory, and patch to the OS vendors that replied -- under embargo, telling them the issue will be public on April 09. This was SuSE (0815 UTC), Debian (0816 UTC), FreeBSD (0849 UTC), AltLinux (1000 UTC). Some other OS vendors replied but we did not give details in time before the issue was public, these included Ubuntu (asked at 1130 UTC), Gentoo (1414 UTC), Chromium (1615 UTC). April 07 - The coincidence of the two finds of the same issue at the same time increases the risk while this issue remained unpatched. OpenSSL therefore released updated packages that day. April 07 (1725 UTC) OpenSSL updates, web pages including vulndb, and security advisory (1839 UTC) gets made public. So to be clear, OpenSSL notified only the following organisations prior to the public release of the issue: Red Hat, SuSE, Debian, FreeBSD, AltLinux. Note: Akamai note on their blog that they were given advance notice of this issue by the OpenSSL team. This is incorrect. They were probably notified directly by one of the vulnerability finders. Here is a quick writeup of the protocol for the iKettle taken from my Google+ post earlier this month. This protocol allows you to write your own software to control your iKettle or get notifications from it, so you can integrate it into your desktop or existing home automation system. The iKettle is advertised as the first wifi kettle, available in UK since February 2014. I bought mine on pre-order back in October 2013. When you first turn on the kettle it acts as a wifi hotspot and they supply an app for Android and iPhone that reconfigures the kettle to then connect to your local wifi hotspot instead. The app then communicates with the kettle on your local network enabling you to turn it on, set some temperature options, and get notification when it has boiled. Once connected to your local network the device responds to ping requests and listens on two tcp ports, 23 and 2000. The wifi connectivity is enabled by a third party serial to wifi interface board and it responds similar to a HLK-WIFI-M03. Port 23 is used to configure the wifi board itself (to tell it what network to connect to and so on). Port 2000 is passed through to the processor in the iKettle to handle the main interface to the kettle. The iKettle wifi interface listens on tcp port 2000; all devices that connect to port 2000 share the same interface and therefore receive the same messages. 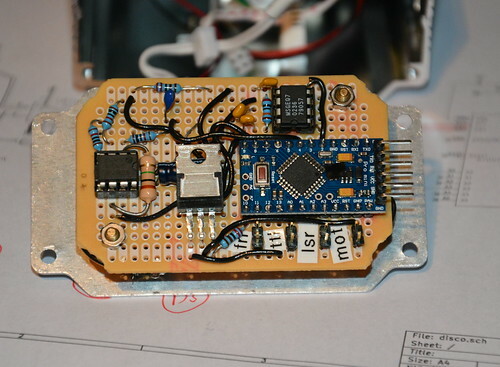 The specification for the wifi serial board state that the device can only handle a few connections to this port at a time. The iKettle app also uses this port to do the initial discovery of the kettle on your network. Sending the string "HELLOKETTLE\n" to port 2000 will return with "HELLOAPP\n". You can use this to check you are talking to a kettle (and if the kettle has moved addresses due to dhcp you could scan the entire local network looking for devices that respond in this way. You might receive other HELLOAPP commands at later points as other apps on the network connect to the kettle. So, for example if you receive "sys status key=!" then buttons "100C" and "On" are currently active (and the kettle is therefore turned on and heating up to 100C). You can receive multiple status messages given one action, for example if you turn the kettle on you should get a "sys status 0x5" and a "sys status 0x100" showing the "on" and "100C" buttons are selected. When the kettle boils and turns off you'd get a "sys status 0x3" to notify you it boiled, followed by a "sys status 0x0" to indicate all the buttons are now off. To send an action to the kettle you send one or more action messages corresponding to the physical keys on the unit. After sending an action you'll get status messages to confirm them. The user manual for this document is available online, so no need to repeat the document here. The iKettle uses the device with the default password of "000000" and disables the web interface. If you're interested in looking at the web interface you can enable it by connecting to port 23 using telnet or nc, entering the password, then issuing the commands "AT+WEBS=1\n" then "AT+PMTF\n" then "AT+Z\n" and then you can open up a webserver on port 80 of the kettle and change or review the settings. I would not recommend you mess around with this interface, you could easily break the iKettle in a way that you can't easily fix. The interface gives you the option of uploading new firmware, but if you do this you could get into a state where the kettle processor can't correctly configure the interface and you're left with a broken kettle. Also the firmware is just for the wifi serial interface, not for the kettle control (the port 2000 stuff above), so there probably isn't much point. The kettle processor knows the temperature but it doesn't expose that in any status message. I did try brute forcing the port 2000 interface using combinations of words in the dictionary, but I found no hidden features (and the folks behind the kettle confirmed there is no temperature read out). This is a shame since you could combine the temperature reading with time and figure out how full the kettle is whilst it is heating up. Hopefully they'll address this in a future revision. The iKettle is designed to be contacted only through the local network - you don't want to be port forwarding to it through your firewall for example because the wifi serial interface is easily crashed by too many connections or bad packets. If you have access to a local network on which there is an iKettle you can certainly cause mischief by boiling the kettle, resetting it to factory settings, and probably even bricking it forever. However the cleverly designed segmentation between the kettle control and wifi interface means it's pretty unlikely you can do something more serious like overiding safety (i.e. keeping the kettle element on until something physically breaks). We were looking for a cheap laser lighting effect for our weekend parties and saw one that looked impressive, the Lanta Quasar Buster 2, and for only £30 new. The unit has both a red and green laser and and a nice moving effect that looks like the beams splits up and recombine again. It promised "sound activation" and we thought that meant it would do some clever sound to light effect, but it really does mean sound activation and just turns itself on when it hears a sound, then off again when it's silent. 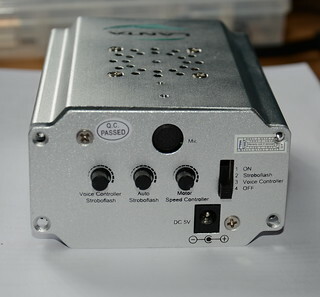 So out of the box the laser has three modes; the first lets you just set the speed of the effect with the lasers constantly on, the second strobes the lasers on and off to a speed you can set, and the third is the usless sound activation mode. Warrany void if removed. I didn't technically "remove" the sticker though. Opening the unit showed that it was easily hackable; all the connections to the control panel were via connectors. 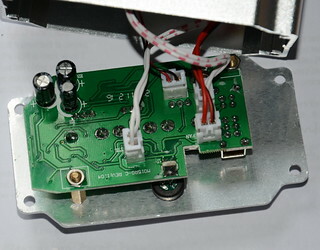 One connector provides +5v to the cooling fan, another +5v to a separate board that handles powering the two lasers, another connects to the motor the turns the optics to produce the burst effect, and the final one has a logic level signal to tell the laser power board if the lasers should be on or off. Since the laser power board is completely separate we can just replace this control panel with one of our own and then we can control the laser on/off and the speed of the motor (actually we could control the direction too but it doesn't really make the effect look any better so I leave it as one direction). And we can always swap the original board back in the future. 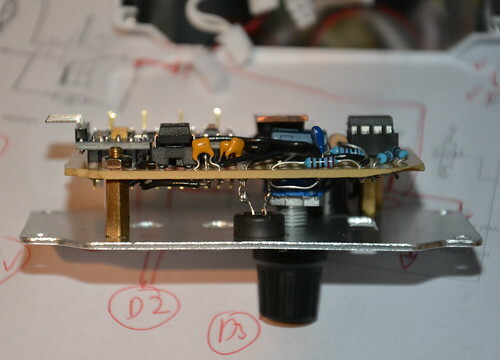 My new control board comprises of an Arduino pro mini compatible board, a rotary encoder for setting the mode and levels, a mic with simple opamp preamp, and a MSGEQ7 chip to do all the hard work of analysing the levels of various frequencies. The optics motor is now simply driven using a PWM output via a MOSFET I had spare. Rough source and circuit diagram are available from github; some components don't have values if it doesn't really matter and others (like the MOSFET) can be changed as I just used things I happened to have in my component boxes. I'm still playing with different effects in software to see what works best. You can read my Enterprise Linux 6.3 to 6.4 risk report on the Red Hat Security Blog. "for all packages, from release of 6.3 up to and including 6.4, we shipped 108 advisories to address 311 vulnerabilities. 18 advisories were rated critical, 28 were important, and the remaining 62 were moderate and low." "Updates to correct 77 of the 78 critical vulnerabilities were available via Red Hat Network either the same day or the next calendar day after the issues were public. The other one was in OpenJDK 1.60 where the update took 4 calendar days (over a weekend)." Note that we can't just use a date range because we've pushed some RHSA the weeks before 6.4 that were not included in the 6.4 spin. These issues will get included when we do the 6.4 to 6.5 report (as anyone installing 6.4 will have got them when they first updated). Note: although we have 3 default criticals, they are in openjdk-1.6.0, but we only call Java issues critical if they can be exploited via a browser, and in RHEL6 the Java browser plugin is in the icedtea-web package, which isn't a default package. So that means on a default install you don't get Java plugins running in your browser, so really these are not default criticals in RHEL6 default at all. You can read my Enterprise Linux 6.2 to 6.3 risk report on the Red Hat Security Blog. "for all packages, from release of 6.2 up to and including 6.3, we shipped 88 advisories to address 233 vulnerabilities. 15 advisories were rated critical, 23 were important, and the remaining 50 were moderate and low." "Updates to correct 34 of the 36 critical vulnerabilities were available via Red Hat Network either the same day or the next calendar day after the issues were public. The Kerberos telnet flaw was fixed in 2 calendar days as the issue was published on Christmas day. The second PHP flaw took 4 calendar days (over a weekend) as the initial fix released upstream was incomplete." And if you are interested in how the figures were calculated, as always view the source of this blog entry.